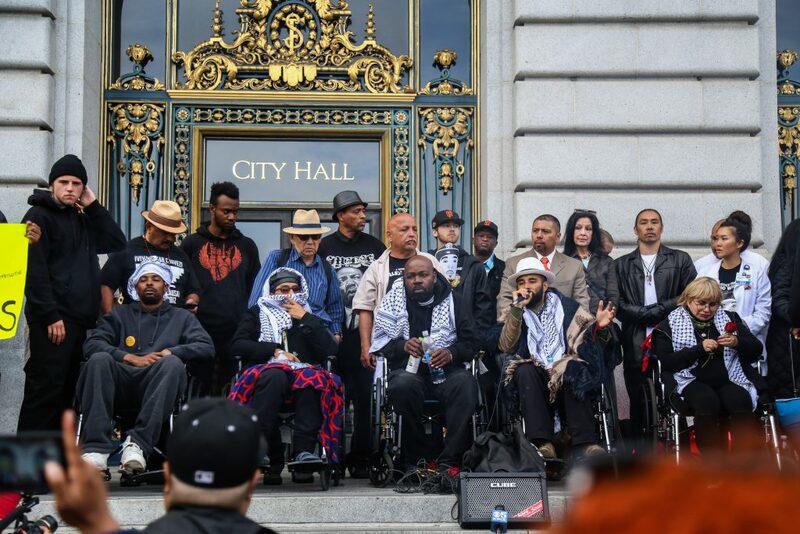 The San Francisco hunger strikers dubbed the Frisco Five rolled to the doorstep of City Hall in wheelchairs on May 3, demanding the mayor fire San Francisco Police Chief Greg Suhr, but the mayor was not there. The Frisco Five—Edwin Lindo, 29; Cristina Gutierrez, 66; Sellassie Blackwell, 39; Ike Pinkston, 42; and llych Sato, 42—had not eaten for 13 days while camped out in front of the Mission Police Station. 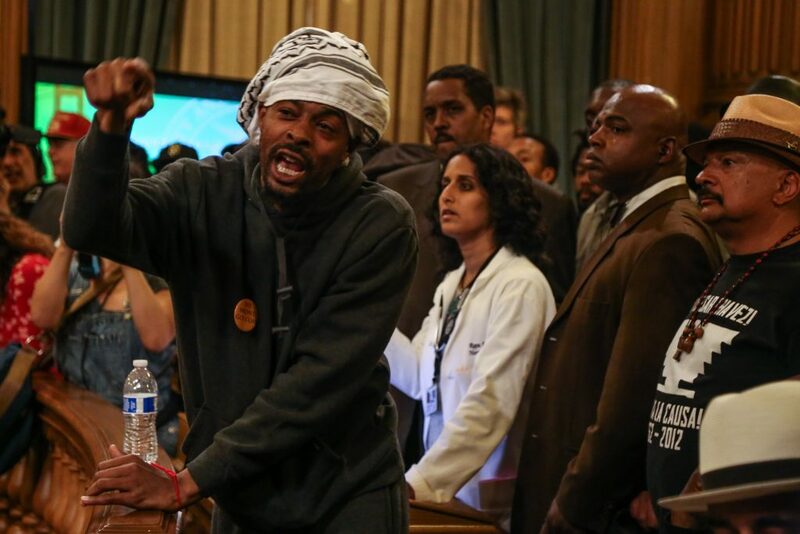 From there, they led some 300 protesters on a two-mile march to City Hall in civil unrest protesting the San Francisco police force, which they have called unaccountable and racist. The five hunger strikers arrived in front of Mayor Lee’s office in City Hall around 3:00 p.m. accompanied by supporters and family members, where a representative of the mayor’s office told the activists that Mayor Lee was in the Bayview. The protesters demanded that the mayor return to meet with the Frisco Five immediately, but were told by the Mayor’s representative that they could instead speak with the mayor’s advisers in room 201. 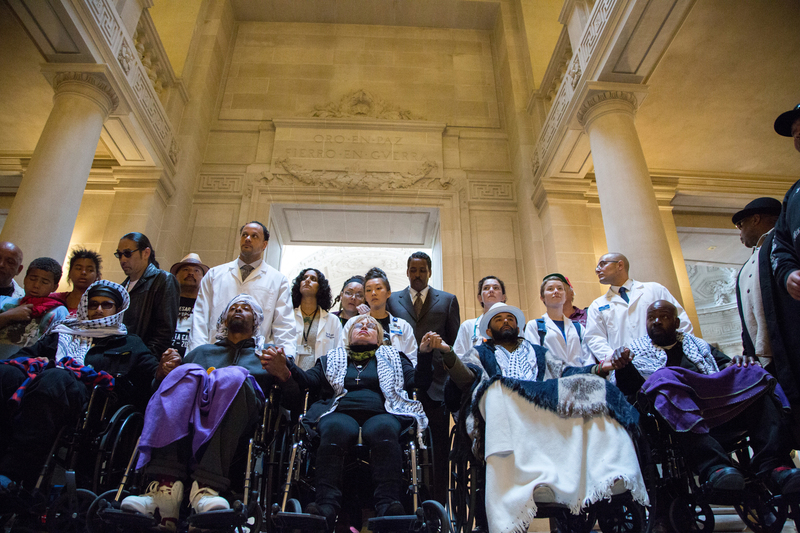 The Frisco Five were wheeled into the chamber shortly after, demanding the Board of Supervisors make an emergency resolution to fire the police chief who they hold responsible for the controversial deaths of Alex Nieto, Mario Woods, Amilcar Perez-Lopez and Luis Gongora, all people of color shot by police since 2014. Hunger striker Blackwell rose from of his wheelchair. “People need to see a morale decision from this chamber. You can either be with the people or you can sell out!” he said. “It’s not just the police chief, it’s about the whole department. 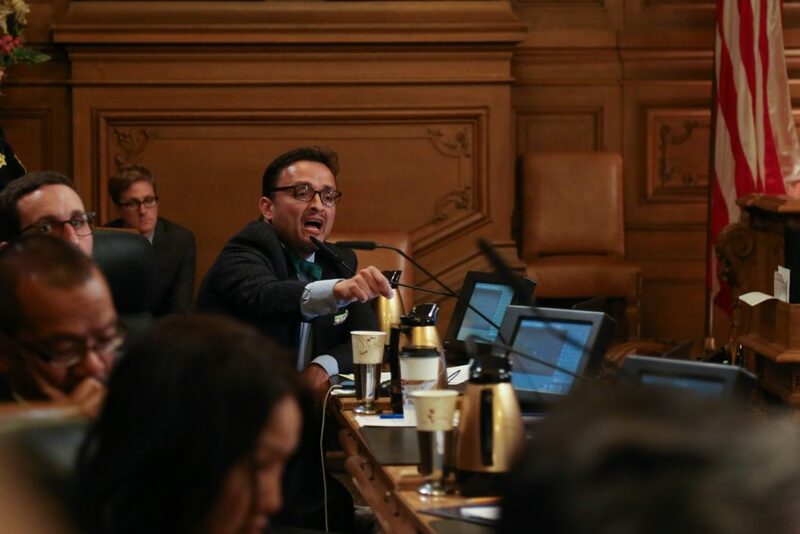 I am here to tell you that we want to work with you,” District 9 supervisor David Campos said. Cristina Gutierrez, the eldest member of the Frisco Five, expressed complete dissatisfaction with the board’s efforts to place pressure on the Mayor to fire Chief Suhr. The Frisco Five said Mayor Lee and the district supervisors are obligated to either fire Chief Suhr or put pressure on him to resign, and root out what the activists deem a systemic and bigoted culture of police violence against Black and Brown members of the San Francisco community. Many elected officials have said firing the police chief will not solve the department’s laundry list of problems—from racist texting scandals to the controversial shooting deaths of the aforementioned four men of color in the past two years—but the activists were adamant that firing the chief is the first step to making serious reform. Chief Suhr told reporters on April 26, six days into the strike, that he has no plans to resign. On the same day, Mayor Lee said he respects the hunger strikers’ right to protest and cares about their health but will continue to support Chief Suhr. After a tense chamber meeting between protesters and supervisors, the Frisco Five returned to the steps of City Hall to address their supporters. 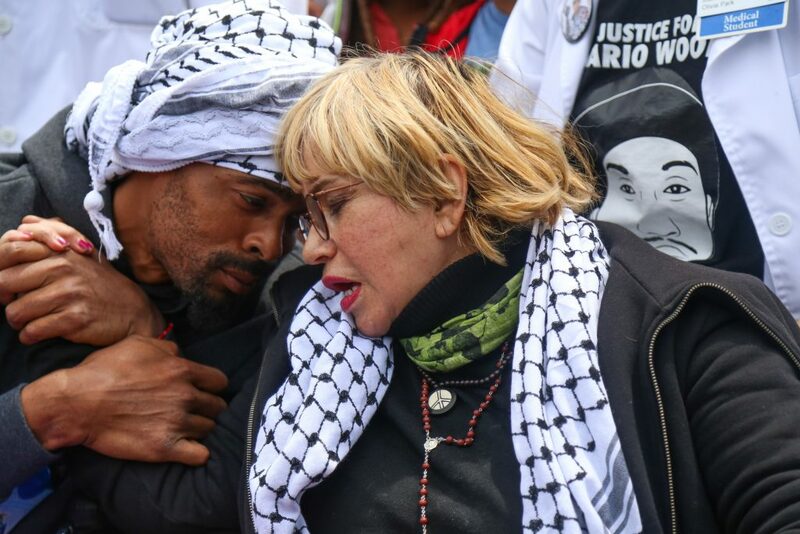 While the hunger strikers’ community support and morale grows, so have their hollowed eyes, slow movements and gaunt cheekbones. A team of University of San Francisco medical students was alongside the activists the entire day, making sure the five stayed hydrated and responsive. Each striker has signed a “refusal of treatment,” opting out of forced treatment if their health worsens.